This attraction's entrance has relocated to Toy Story Land. Toy Story Mania! 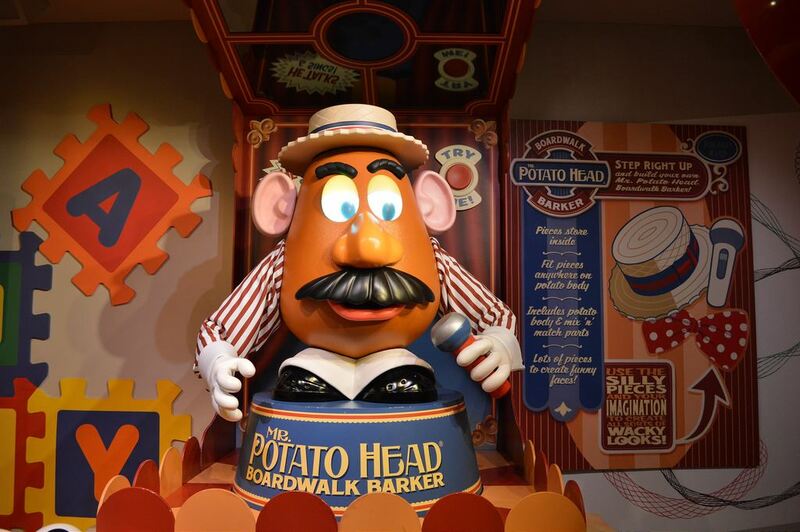 ushered in a whole new generation of Disney attraction: the “virtual dark ride.” Since Disneyland opened in 1955, ride vehicles have moved past two- and three-dimensional sets often populated by Audio-Animatronic (AA) figures. These amazingly detailed sets and robotic figures defined the Disney Imagineering genius in attractions such as Pirates of the Caribbean, The Haunted Mansion, and Peter Pan's Flight. Now for Toy Story Mania!, the elaborate sets and endearing AA characters are gone. 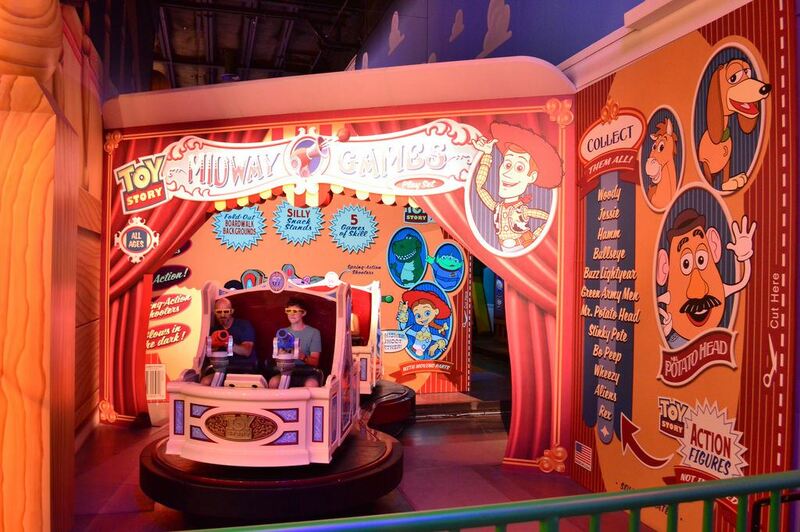 Conceptually, this is an interactive shooting gallery much like Buzz Lightyear's Space Ranger Spin, but in Toy Story Mania!, your ride vehicle passes through a totally virtual midway, with booths offering such games as ring tossing and ball throwing. You use a cannon on your ride vehicle to play as you move along from screen to screen. 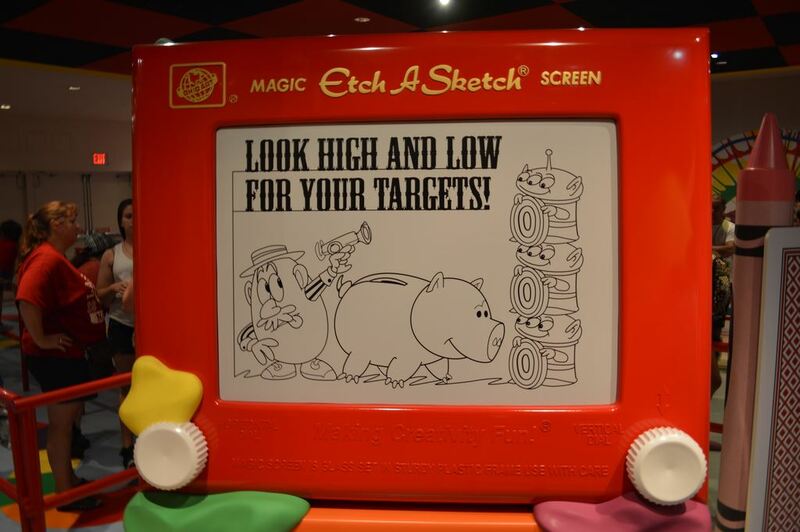 Unlike the laser guns in Buzz Lightyear, however, the pull-string cannons in Toy Story Mania! take advantage of CG image technology to toss rings, shoot balls, even throw eggs and pies. Each game booth is manned by a Toy Story character who is right beside you in 3-D glory, cheering you on. In addition to 3-D imagery, you experience vehicle motion, wind, and water spray. The ride begins with a training round to familiarize you with the games, then continues through a number of “real” games in which you compete against your riding mate. The technology has the ability to self-adjust the level of difficulty, and there are plenty of easy targets for small children to reach. Tip: Let the pull-string retract all the way back into the cannon before pulling it again. Because it’s a ton of fun and it has a relatively low rider-per-hour capacity, Toy Story Mania! can get some long lines. Getting to the attraction early or riding late is the best way to avoid a significant wait. 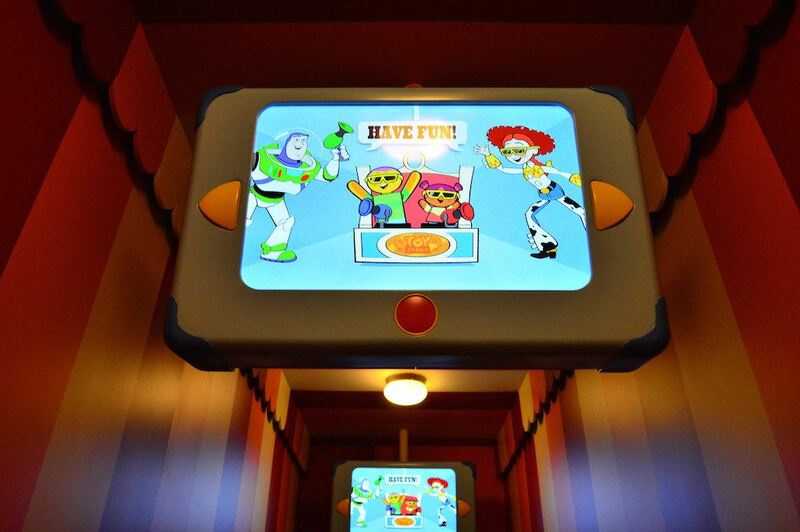 Another alternative is to obtain FastPass+ reservations for Toy Story Mania! but you’ll need to act fast: Even on days of moderate attendance, all reservations for the day are usually gone by 11 a.m. Most guest go toward Toy Story Land first thing in the morning and while Slinky Dog Dash is the big draw, Toy Story Mania gets much of the crowd runoff as well as the families whose children don't meet the height restrictions on the other rides.. Waits at Toy Story can reach 90 minutes or more on a busy day. In fact, the lines grow so fast that in about a third of our touring plan variations, we recommend getting a FastPass+ reservation for 9 a.m.–10 a.m., even when Toy Story is the first step in the plan. The two benefits to doing this are that you’ll shave off at least 10 minutes of waiting, and you don’t have to line up as early at the park entrance to join the mad run to Toy Story Land. This chart shows you roughly how long you'll wait for Toy Story Mania! when you visit on a day with a given Disney's Hollywood Studios Crowd Level. The blue bars represent the average "peak" wait time (that is, how long the line will be at its busiest). The bottom and top black lines represent the range of peak wait times to expect (for you fellow nerds out there: it's the 5th percentile and 95th percentile of peak wait times). Please note that these are estimates, and for a better forecast for your travel dates, see Toy Story Mania! Wait Times. Touring Plans with Toy Story Mania!